The Saute Cafe was a popular restaurant in rapidly growing north Ocean City in the early 1980’s. Located at 123rd Street and Coastal Highway, the Saute Cafe had developed a loyal following among both locals and numerous condominium owners in that section of town. 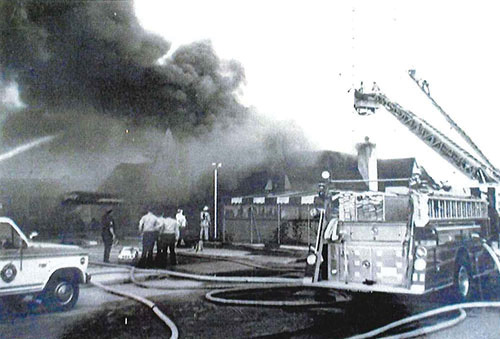 Tragedy struck on July 16, 1983 when a fire broke out shortly after 6 a.m. In the course of battling the blaze, Ocean City volunteer fire fighter Jeffrey Dieter, age 24, became trapped in the burning building. He would become the first Ocean City fireman to die in the line of duty in over 45 years. Dieter would receive a fireman’s funeral with firefighters from six states in attendance. A young man from Delaware would be later arrested and convicted of arson. The Saute Cafe was destroyed and never rebuilt but left a legacy in the resort’s building code. Within a week of the tragic fire, the City Council voted to require automatic sprinkler systems in all new nightclubs and restaurants.